If those still doubting Americans are finally ready to get real about the issue of climate change after Hurricane Michael, it will be in some measure thanks to the efforts of photographer Edward Burtynsky, who has documented, in his spectacular, large-scale color photographs, the effects of human development — i.e., from rock quarries in New England and Italy, to Chinese megafactories — on the natural landscape. Take a look at Jennifer Baichwal’s 2016 documentary film on Burtynsky, “Manufactured Landscapes.” In “Anthropocene,” which takes its title from the designation for our current human-dominated paleontological epoch, Burtynsky continues to boggle the eye while simultaneously needling the moral conscience. 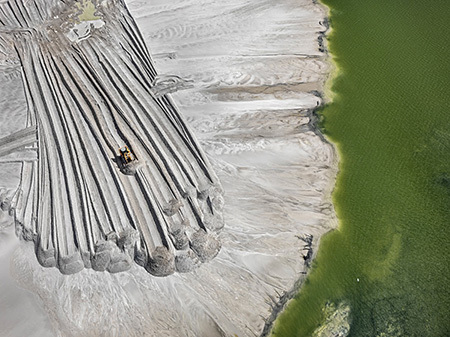 Photographed over the course of five years, the twelve “Anthropocene” images provide us with a stunning god’s-eye view of the human-altered landscape. With a preternatural focus, heavy machinery is reduced by the panoramic scope to the size of ants. We are made to feel alternately proud and abashed by the human ingenuity so vividly revealed here. Nine of the photos are shot from so high up that no horizon lines appear, and the works become abstract. “Phosphor Tailings” resembles a detail shot of a heavily impastoed painting. The white furrows of ‘paint’ are pushed by a tiny tractor. A second photo of the same site, taken from a higher altitude, contracts the immense operation into a microorganism. “Tyrone Mine 3” contrasts an Escher-like maze of meandering ridgetop roads to the violent striations of exposed geology. “Uralkali Potash Mine 6, Berezniki, Russia” depicts a series of concentric circles resembling a chandelier ceiling sconce, possibly fossilized — as well as the annular mating nests, on sandy ocean floors, created by male puffer fish. Spectacle is not always superficial.